Good Karma K9Z team travels coast to coast collecting trophies, entertaining crowds and making smiles ear to ear. 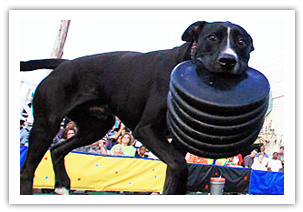 From county fairs to corporate picnics to halftime entertainment, indoor or outdoor, Good Karma K9Z can create a professional, high-quality show to OOOH and PAW your audience. Good Karma K9Z creates custom shows for birthday parties, family reunions or any personal/family event. 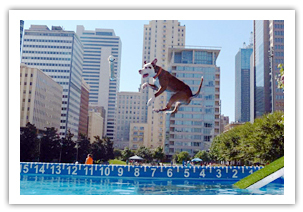 Our athletes are pets and family members who consider entertaining your human friends a FURR-most priority. Altogether, GKK9Z team has a combined 50+ years experience competing in sanctioned national events in Flying Disc and Dock Diving. Good Karma K9 skills are ir-RUFF-futable.